Our group members were among the first to be invited to preview the beta version of the newest Rezzable creation on Monday. Not one of the 9 or 10 NPIRL’ers I have spoken with survived long enough to experience (or cam) even half the build, and most gave up that day after three attempts/kills (you get sent back home o.O!). Of the three most recommended highlights: lady liberty, the foundry and reactor buildings, and the train, I only managed to see one of them myself... and then those pretty pink petals swallowed me up. I Skyped yesterday with Toxic’s team leader, Foolish Frost, and his RL/SL wife Botany Black - the lead designer for organics - and learned that they started working on this project 6 weeks ago, but that sculpties were not initially used. Foolish, who works a great deal with Blender, stressed that Toxic was a group effort and that nearly every piece had passed through many hands. “All got to put our best into it; none of us own one piece of it,” added Botany. The primary culprits for avatar kills are the artificially intelligent, path-finding dirge/ant drones, which make decisions as they travel from one point to another, determining what is needed, communicating with each other and hunting stuff down. This feature plus the animatronics (built into the winding vine tendrils and avatar-gobbling flowers), are two of the novel aspects at Toxic. #2 Stay away from the ants. Get off the path immediately if you see one coming. Thanks for the preview, Foolish and Botany! We look forward to exploring Toxic and learning what comes next in this fascinating build. P.S. I just counted, and give or take a few, looks to me like Rezzable Productions, Ltd owns 32 sims. That's thirty two. XXXII. Rezzable, btw, is actively hiring creators and managers. Looking like mere specs on the Rezzable chunk of the map - you are required to look further in every direction - are Toxic Garden Rezzable, the much adored and practically-perfect-in-every-way Greenies Home Rezzable, and Cannery Rezzable which this afternoon inaugurated a smart and polished photography show featuring portraits of avatars. SL photographers Shoshana Epsilon and Vint Falken curated. For those of you who live in Los Angeles, some of the design elements of the gallery might remind you of the astonishing building that was especially created to house the Ashes and Snow show that sat on Santa Monica beach last summer. * SENUKA HARBINGER'S studies of fractals and formulaic art forms in-world have resulted in the creation of two true fractal generators. DON'T miss her breathtaking, meandering spline generator sculpture. 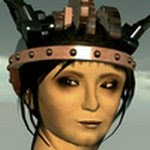 Senuka's Cyber Arachnid avatar is unquestionably NPIRL, as is nearly everything this extraordinary woman takes on. Ask her to give you a demo of those fractal generators but you'll have to get permission in the sandbox... 4000 to 10,000 prims in under 5 minutes! * THE REALITY FACTORY - not! New NPRIL member and sculptor Blackthorn Hare (RL Doug Anderson, working on his art masters at Mass College of Art) agreed that this angry place - which he completed last month - could be called "The Un-Church." He invites you to "poke around... there are lots of clues, little easter eggs here and there." (A Meditation)- Also by Blackthorn Hare. Look underneath you. Hang around a moment and watch the moon rise. Cube Inada - who believes in "space-age design optimism" - doodled this spruced up Googie-romanticized/retro sci-fi drive-in in the sky that should please anyone who grew up, or wished he grew up "inside" a Jetson's cartoon. Park your spaceship and hang with your buds while taking in a B-film... "Plan 9 from Outer Space," perhaps? * ESCH SNOAT'S' "See What's Inside Esch's Head!" - This is just pure folly and fun, but first a pile of instructions to make it easy for you to find this. Use this slurl - See What's Inside Esch's Head! - TP to the 3rd floor and walk to the back of his show... Now then, let's "See What's Inside Esch's Head," shall we? Use Mouselook! BTW, two NPIRL members have shows in this building as well: Finny Yates and Douglas Story. Thinkerer Studios - founded by NPIRL member Thinkerer Melville - has announced the launch of an awards program to identify and encourage the development of creative products and services that use SL capabilities to enrich experiences in RL. Recipients of the Thinkerer Challenge Award will receive 30,000L and the use of a land parcel (or an equivalent arrangement) for one year. In addition, they will be invited to become judges of future Thinkerer Challenge Awards which will be given as often as once a month, depending on the volume and quality of nominations. You can read more about it here. Juria Yoshikawa is like the Energizer Bunny; just keeps going and going... I keep thinking I'll hold back and not mention Juria's work at least one week, but darned if it isn't just too good to hold back. The sound effects, as you hop in and out of the cubes... well, you'll hear. I wish Jimmy Hendrix was here to hear this, too. I do. Our very own Seifert Surface is a postdoctoral mathematician who can explain, in terms a layperson can grasp, what in the heck is going on with the many (dozens and dozens - is that a legitimate quantity, Seifert? ^.^) elegant, math-inspired sculptures he's not only built but often scripted. But his work isn't just about mathematical representation. These things are... beautiful. Yep. And fun. And most would simply not be possible in Real Life. Well, maybe some of them would be but you would need a budget equal to the GNP of a small nation to realize them. So... on Friday, August 17th, this math-mage hosted TWO tours for NPIRL'ers at his Future sim, rezzing things from his inventory, activating kinetic sculptures such as a rotating 4D hypercube and a procedurally-generated Fibonacci sequence, and then...he explained them! T'was great fun walking all over the Costa-Hoffman-Meeks surface and then having him personally demo his interpretation of Robert Heinlein's Crooked House. I'm sorry if you weren't there. Was way cool. For those of us who have always thought of math as a PITB (you figure it out), this was math therapy. But go check this place out anyway! On a practical level, *his elevator and transporter system alone* are reasons enough to drop everything and run over to have a look. Hey Scope Cleaver: thank you for introducing us to Seifert. He's a keeper! Make no mistake. We are on the prowl for all the greatest Not Possible IRL builds, and if someone beats us to the punch on something truly splendid, then we will hand them to you on a silver platter, as we must today. NPIRL'er and New World Notes' scribe, Amalthea Blanc, blogged the very fine and challenging article Top 10 Art Installations of Second Life yesterday, featuring several of our members and a couple of tremendous people we've missed along the way. Tayzia Abattoir... (insert hand wringing here) you were so right! DanCoyote Antonelli's new show is... is... Well, I missed the boat and cannot justifiably blame it on absent LMs. Everyone, get thee over there and do as DanCoyote recommends: change ALL your settings with wild abandon and discover this vertical masterpiece. More than one of the individuals featured in Thea's piece are artists-PLUS. They stand for something even greater than their own art work. Case in point: Keystone Bouchard. His Gallery of Reflexive Architecture is at the apex of of the NPIRL experience and invites the avatar to move through, over and under his undulating, interactive sculptures. But perhaps even more exciting is his use of Second Life to plumb what he calls the "3D Internet" to virtually and collaboratively design via Open Source Architecture, or Wikitecture 2.0. And get this... if ever there was an activity that underscores our collective shout that SL "is NOT a game," Keystone's RL architectural firm constructs buildings in-world first, allowing their RL clients to log in and experience the build before brick meets mortar. This notice was issued to NPIRL members on August 10, 2007, in-world. We are lucky lucky lucky to have Tayzia Abattoir in the group. What a treasure trove. She giggled when she learned that I had not experienced Nomasha Syaka's Blender. Take a friend (and maybe an enemy, too ^.^) and follow the trail of apples to the last one. Touch and "eat it." ~ Nomasha... welcome to our group! I'm afraid I drooled a little bit over your guitars and sculptures, too. ~~ Nomasha owns the group "I use my nose to type..."
Dali-esk, monochromatic, other-wordly, and definitely NPIRL. Numbers dash about and squeal. All the info is in Japanese... so I watched the video at Crazy-Genius . Anyone know these builders? Can steam punk - in its varous SL manifestations - ever be NPIRL? Sound off on the blog. But first check dis place out. Later, you can take the hot air balloon, and lazily work your way down to the diff levels. Teleporter in the cafe, btw, is the cardboard box. This visit will take a bit of time, is well built, and is a pleasant way to unjangle your nerves after a hectic day. * Some NEW excellent things at the Greenies Home Rezzable, created by NPIRL member Pavig Lok and team. - Felix Wakmann - thanks again for the fab SLBrowser freebie, Felix. You guys gotta check it out. Really. Thanks to Corporate Jay for his help with the management of this blog. ~~If you are an NPIRL member and would like the rights to initiate a post on our blog, please contact me in-world. ~~All back notices will eventually make their way into the blog. This way we can share our finds with the rest of the metaverse, and have a handy archive, too. * SKINS. I suppose this is possible IRL, given the right cosmetic surgery, but the pain, the cost, the vanity! We've all shopped for skins, but just for sheer comedic value, check this one out: Limited edition skins for 20,000L. Yes, you read right. TP to the skin section and look for the LTD Edition corner. What do you think? When Akasha Wachmann handed me this LM, I envisioned a giant interactive monopoly game. Almost right. It's a new shopping mall in the sky. Talk about location, location, location. And yes, pick out your token and surf your way to Park Place. Not sure if you get $200L for passing go. WELCOME to our newest members; we are better for knowing you! Thanks to Douglas Story for all his help here. Check em out. Can steam punk - in its various SL manifestations - ever be NPIRL? Seriously, I've fallen in love with it. Thanks to NPIRL member Felix Wakmann, we have a way to view item listings/land listings/ads & more almost instantaneously. Definitely better than minimizing the viewer, loading up firefox, and browsing slexchange or slboutique endlessly for an item that's not listed! If you've saved the browser to your inventory and haven't had the chance to use it, or think it as just another freebie that you'll never use and will end up clogging up your inventory, pull it out, NOW! I demand it. Begin to toy around with it. Its easy to use interface can be picked up in a matter of seconds. Praise the SLBrowser for integrating our lives even further! And three cheers to Felix for coming up with a superb product. Oh, and a heads up, if you see me around, typing question marks before random phrases, I am completely sane ^___^. Over the past few days, interest in NPIRL has mushroomed and a number of very talented people have joined. I must remark on two of them. Tonite, the "architect's architect" of SL, Scope Cleaver , became a NPIRL member and Hamlet Au (aka Wagner James Au) appointed a representative from his New World Notes to the group: Amalthea Blanc. Welcome, you two. We are honored. I propose to all of you now that we restrict all future membership to only the most serious or promising content creators. Period. I see this as a working group, and while you may not know everyone here, I have had an opportunity to speak with each of you. What we have here is pure gold. Meanwhile, I have some extreme goodies just begging to be shared with you and I can hardly wait till Friday to do so. WELCOME to Juria Yoshikawa, one of our newest members. Most of you have been to Juria's "Blink," a creation that is at the nexus of what our group is all about. ****NOW Juria is creating an underwater scheme that is only possible in our dreams. Light to midnite and crank up that sound. I spend way too much time here. SEIFERT Surface, a real world mathematician and in-world creator, has promised to give us a tour of his works soon, but you can get a jump on things by visiting his June 2006 recreation of Robert Heinlein's Crooked House, built like a four dimensional hypercube. You can read more about it here. FYI : In mathematics, a Seifert surface is a surface whose boundary is a given knot or link. New NPIRL member Kazuhiro Aridian has been drawing large crowds at the Isle of Wyrms sandbox while she tries to finish up her work - on an avatar made of sculpties that TeeCee Towradgi described as "just crazy nuts!" Ooooo! Aaaaaah! Kazuhiro pointed out that if sculpties are your thing, then you'll want to see Wyeth Greene's giant crab, even before he textures it. Sabine Stonebender's Zero Point - recommended to the group last week "Stop thinking!" - was written up in a relatively new pub on the arts in sl: http://www.slartmagazine.com/ This build is so complex that it merits multiple visits. Look for the Vomit Comet and the throne. Text 100 Island is the SL home of a PR consultancy and yes... it is *another* one of those (eyeroll here) spaces of corporate nothingness that we all love to hate. HOWEVER... in terms of design (lead designers Rez Menoptra and Endira Udal) this is a note-worthy attempt at architecture that is Not Possible IRL. ^.^ I rather like the suspended theatre chairs. omg omg you guys ROCK! This group isn't just vibrating, it's zooming. See below for SLURS to two feasts for the ears, and let's hit the steam, shall we? Thomtrance O'toole just pointed us to a trippy Japanese steam punk + fusion build which we will be featuring soon. Which are the best steam punk builds in-world??? Let's pull together a fab tour. Stop by for a quick "See" (ahem... "listen"?) at his Interactive Singing Sculpture - A Cappella. 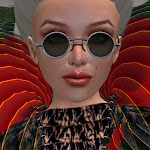 ++RL/SL photographer Wellington Bahram turned us on to Adam Ramona's Interactive Sculpture Garden of Immersive Sounds. FYI: Adam Ramona is RL Adam Nash, digital audiovisual artist, composer, programmer, performer & writer. Presented in galleries, festivals & online in Australia, Europe, Asia & The Americas, including SIGGRAPH, ISEA & the Venice Biennale. Notice issued to the NPIRL group on July 23, 2007. Our own Hotspur O'Toole maintains a delightful blog about his experiences in-world ,and this is not the first time he writes about our group. BUT THREEE Not Possible IRL whistle stops. Giant Flowers - stand in them and touch the petals! Thanks for the tip, Chime Desoto! And if for some reason you have missed this... be sure to visit Juria Yoshikawa's newest show: Blink. This show has closed. I've asked for a special demo for our group. Wanted to give you as much advance notice as possible. Come see a demo of the first in-world, on-grid sculpty editor and creation system: the SnurbO'Matic, by NPIRL member Elzbiet Meili and her husband. The Not Possible IRL group members are the first to receive a copy of a cool new creation by our own special effects and gadget guru, Vandalite Defiant. This handy thingamijig mirrors a prim, AND its textures through a mirror rotated by any random value, with six-decimal-digit accuracy. Note: Do not delete the box this comes in. Thanks, Vanda! Contact me if you missed out on this and want a copy. This gorgeous show - definitely Not Possible IRL - opens to the public on Saturday but the creator, our own Douglas Story, is letting us preview now. What does it feel like to visit a flower as a bee or a hummingbird? While that isn't the stated intention of the show, I believe this is the closest we are going to come to that experience. * Read the notecard upon arrival as you should change your settings to enjoy fully. * And hey, it's on the usually not open-to-public and way cool Princeton sim. Three guesses what we Dutch like to build in SL... that's right; windmills! Dutch artist Edo Paulus (Edo Autopoiesis in SL) has built a "sound composition" that uses SL wind to generate sound from windmills. The result is not exactly punkrock, (more like indonesian gamelan) but I'm sure some of you hippies might enjoy. I like it for how it looks and works. Nifty stuff. Pick up the notecard that explains how it works and go take a ride. Cool freebie time! And definitely Not Possible IRL. One of our members and a first-rate coder, Chime Desoto, created the attached Changing Room for newbies about a month ago. Rez, sit, and it checks for a private place in the sky and zooms you up there, into a little room where you can stand in your skivvies in peace. Well, it may have been conceived for newbies, but yours truly depends on this item nearly every single day. Chime tells us that he has plans to make a retail version of this item. Enjoy! Contact me if you missed out on this and want your copy of Chime's gizmo. Poor RL... little do they know that 5 years from now they will all be signed up for metaverse-aholics support groups, having their food delivered at home, and disconnecting their cable tv service. Notice originally issued on July 12, 2007 to the NPIRL group. OK, OK, so maybe you are hardly ever - or maybe never - a merperson in world (and certainly not IRL), but our own Akasha Wachmann has created a fantasyscape and playground that definitely merits your visit. All this just a water slide away from her superstore for merfolk. I love to hop in the crystal ball and float for a bit... ^.^ Oh, and catch a great movie while you're at it, too!